Uh hello again. Its my next topic in short time heh. Happens only on idle. Clocks are jumping and voltages are jumping too on idle, but its normal i think. SO maybe VDROOP? But if VDROOP why it wasnt happening when i was plugged with 1080 ti aorus. Heh? During games,benchmrks no whea loggers. Conclusion: It happened again repeatedly after plugging Gigabyte Windforce 2080 ti . That whea-logger 19 cache hierarchy error ( warning ). Windows 1803 the newest build ( KB ) installed in 05 may. Each warning 1 minute only on desktop/idle. When gaming or full load , not warnings. Also pc stable,no errors,crashing. Any ideas? Re: VDROP - issue? Whea-logger 19 events each second on event log on idle only. 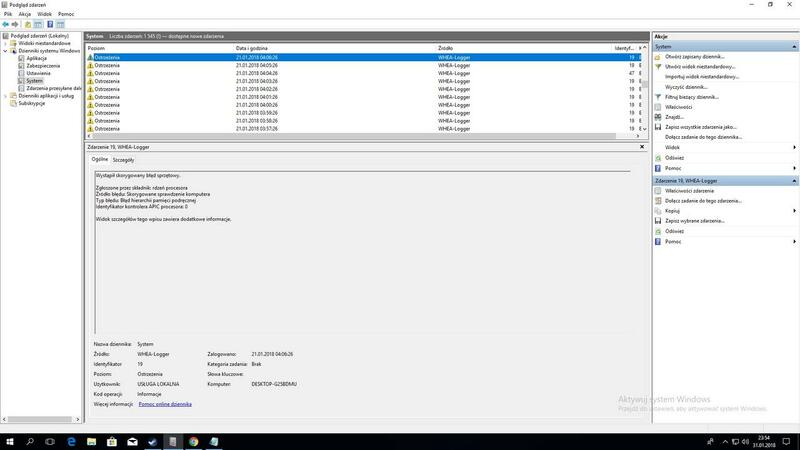 Stop looking at event viewer? Seriously, if nothing is affected I wouldn't worry about it. I have friends with 8700k builds and they have been having random issues since 1803 dropped and stranger issues with 1809.